Davis | Dramatic Simplicity™ — GOOD THiNS are Happening! Building and launching a new brand is sometimes less onerous than renovating one with existing qualities. However, there are many moving parts and much more riding on its success or failure. Enhancing the equities of a current brand is like wearing a new suit: you look different, but people already know your character. When launching a new brand, you need to introduce yourself, make people understand what you’re about and tell them why they should be interested…in about 3 seconds…no problem. The solve? Tell a story so captivating the consumer will spend more than 3 seconds at shelf. Start a conversation so they can enter into the dialogue. Look at the way GOOD THiNS would behave as a “Just because we’re serious about being better doesn’t mean we take ourselves too seriously” product. Communicate emotionally rather than factually. 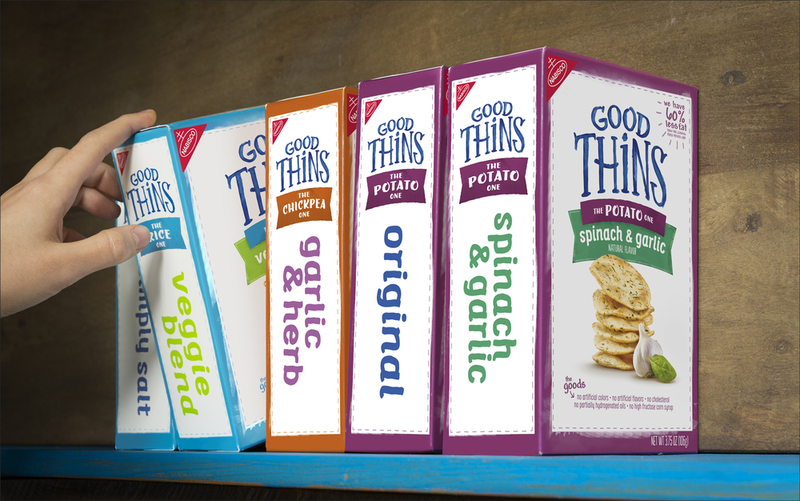 GOOD THiNS leverages each and every touchpoint in a unique way, always laddering back to the brand’s core belief. The face panel introduces GOOD THiNS’ playful personality, the flavor depicts what’s different and the expression of its wholesome goodness is lighthearted. We want consumers to thin-vestigate more! With GOOD THiNS, Davis was tasked with creating and introducing a brand that touts taste and goodness in a compelling yet differentiated way. This premise is not completely revolutionary in the world of snacking. In fact, there’s a sea of brands “out facting” one another. It’s early days for this young brand, but it is exceeding expectations — there are GOOD THiNS happening in snacking!